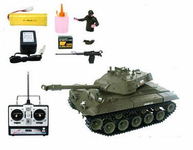 Infrared radio control (RC) laser blasting battle tank. Buy 2 tanks and battle your friends. These tanks have a fantastic look, shoot safe plastic pellets, make sounds, smoke, and have a genuine feel compared to other tanks on the market. Brand new radio controlled tank is the LARGEST rc tank made. Highly detailed, makes smoke, and comes with a 6 channel remote control. The US M41A3 radio control tank has a built in smoke generator and sounds to simulate the real thing. Get ready for this extremely high quality tank with metal gears and treads. Full function turret, sounds, smoke, and working cannon. Intermediate remote control (RC) tanks are great for almost any skill level. Now you can buy the best tanks with many different features such as simulated smoking engines, engine sounds, and real working turrets. Mount a wireless camera on your tank, go on a real mission, and hunt down your opponent. Need an added effect? Some of our RC have working battle tanks shoot safe plastic shells. Just think of all the fun you can have. Shop all of our RC tanks, army toys, and RC cars for sale.